Most lobbyists loathe Donald Trump, but they may thank the Republican presidential nominee for helping them scare up business during Congress&apos; extended hiatus. 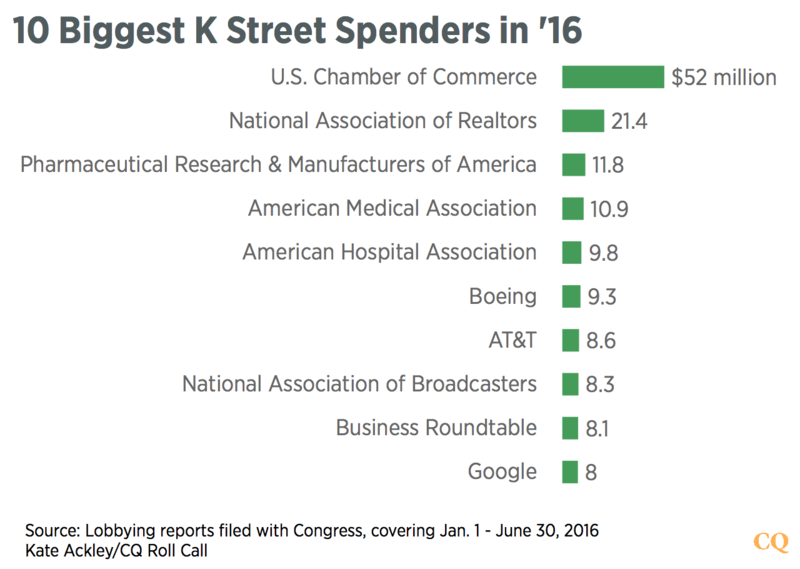 Battles over spending bills, an update to chemical regulatory laws and a measure to spur biomedical research helped fill K Street coffers during the first half of the year, according to recently filed lobbying reports. But with Congress away for a good portion of the second half of the year, lobbyists expect to spend most of their time with frazzled clients, trying to make sense of an unpredictable presidential election and preparing for what&apos;s next. The National Association of Realtors and trade groups representing drugmakers, physicians and hospitals factored prominently on the list of top spenders. So, too, did corporations such as Boeing, AT&T and Google, according to filings made under the Lobbying Disclosure Act. Lobbyists say the impasse over spending bills to keep the government running in fiscal 2017 is turning into a crucible for their clients’ priorities. During the first half of the year, lobbying firms followed the lead of top Republicans in Congress and approached the process bill by bill, going through the motions of so-called regular order. But with time running short, lawmakers are almost sure to start moving a stopgap or catchall measure in September to avoid a shutdown. Darrell Conner, a leader of the lobbying practice at K & L Gates, said his firm’s revenue was down slightly this year, at $8.6 million for the first half of this year, compared with $9.3 million during the same period in 2015. But he said he expects a rebound as clients try to sort out election-season rhetoric and the political brinkmanship on Capitol Hill. Trump and his opponent, Hillary Clinton, have blasted trade deals such as the Trans-Pacific Partnership — a top priority for business interests, including the biggest spender on lobbying, the U.S. Chamber of Commerce, which paid out $52 million in the first half of the year. Add to that the uncertainty over control of the Senate, which could potentially flip to the Democrats. Some of this election analysis and preparation work isn’t necessarily reflected in the lobbying disclosures. Squire Patton Boggs, one of the city’s biggest practices, saw a decline in its revenue in the first half of this year versus the first half of 2015, sliding from $13.5 million to $9.3 million. “As always, LDA filings capture only a minor portion of the overall policy work being done by our firm globally,” said David Schnittger, a senior policy adviser. The firm&apos;s recent clients include Amazon.com and SpaceX. Health care, financial services, defense and technology policy, such as the debate over how the government should regulate the use of drones, dominated the first half of this year, Conner said, noting that K & L Gates added hires such as former Rep. John McHugh, a New York Republican and former secretary of the Army. As for the upcoming debate over funding the government, Conner said his clients will be tuned in. “It may be an omnibus or a minibus or a CR, but there is always a legislative vehicle that moves on appropriations and our clients, and the members of Congress are obviously looking for opportunities to advance their legislation,” he said. And a real boost to K Street business could be just months away. Gearing up for a long-term debate over an overhaul to the nation’s tax laws may spur new business, Gold notes. The first half of 2016 wasn’t bad, in part because Senate Majority Leader Mitch McConnell “has done a good job of sort of getting the Senate more functional,” added Gold, a Democrat. Big measures such as the update of chemical regulatory rules were heavily lobbied. “If we were outside an election window, you’d get a bipartisan agreement that the floor moved better this year,” Gold said.